Anyway, he wanted to know what the effort would be to create an IdeaJam iWidget for the Lotus Connections Homepage and what would be the easiest approach. I told him that if he could get me a very simple HTML page, I could do an iWidget that would call that HTML page via an IFRAME. We agreed that we would follow up today in the morning to see how much progress he'd made. Turns out that about 1/2 hour later, he lets me know that his side is done. To say the least, I was very impressed! 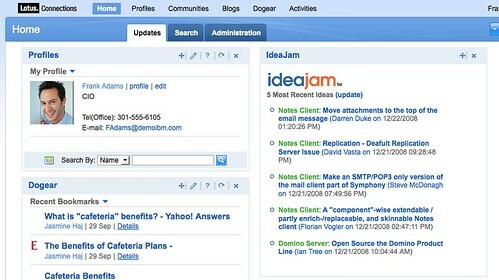 You see, IdeaJam is a Notes/Domino application. Therefore, all he had to do was create a new 'View' that provided just the data that he wanted and rendered that as HTML. (Don't ask me what a View is.. I know very little about Notes/Domino applications, but I'm sure Bruce will discuss more at his blog later today). Now that he had his View rendering the data, I had to create the actual iWidget to be deployed onto Lotus Connections. This process took about 2-3 minutes! The iWidget is very simple and only has about 4 lines of XML in it. If you want to take a look at the iWidget XML, click here. I then went into the Lotus Connections Administration interface, added the iWidget to the Homepage (which I have already proven that it takes less than 30 seconds) and voilá! I think that what's also impressive about this story is that Twitter enabled this collaboration. I've only met Bruce (recently) via Twitter and had never collaborated with him before! Yet, we were able to get together and quickly create this nice piece of integration! Very cool, right? What do you think ?